Seat of the Universal House of Justice in Haifa, Israel. For the building, see Seat of the Universal House of Justice. The Universal House of Justice (Persian: بیت‌العدل اعظم‎) is the nine-member supreme ruling body of the Bahá'í Faith. It was envisioned by Bahá'u'lláh, the founder of the Bahá'í Faith, as an institution that could legislate on issues not already addressed in the Bahá'í writings, providing flexibility for the Bahá'í Faith to adapt to changing conditions. It was first elected in 1963, and subsequently every five years, by delegates consisting of the members of Bahá'í National Spiritual Assemblies throughout the world. The Universal House of Justice, as the head of the religion, has provided direction to the worldwide Bahá'í community primarily through a series of multi-year plans, as well as through annual messages delivered during the Ridván festival. The messages have focused on increasing the number of Local Spiritual Assemblies, translating Bahá'í literature, establishing Bahá'í Centres, completing Bahá'í Houses of Worship, holding international conferences, and developing educational systems to enhance literacy, the role of women, spirituality for children and youth, family life, social and economic development, and communal worship. The Universal House of Justice has also played a role in responding to systemic persecution of Bahá'ís in Iran by garnering worldwide media attention. The books and documents published by the Universal House of Justice are considered authoritative and its legislative decisions are considered infallible by Bahá'ís. While empowered to legislate on matters that are not explicitly stated in the Baha'i holy writings, the Universal House of Justice has, since its inception, limited its exercise of this function. The Seat of the Universal House of Justice and its members reside in Haifa, Israel, on the slope of Mount Carmel. The most recent election was 29 April 2018. Although all other elected and appointed roles in the Bahá'í Faith are open to men and women, membership on the Universal House of Justice is male-only, providing an exception to the basic Bahá'í principal of the equality of men and women. The Bahá'í writings do not give a reason for this exception, but that the reason will become clear with time. Original members of the first Universal House of Justice, 1963. Bahá'u'lláh, the founder of the Bahá'í Faith, in his book the Kit��b-i-Aqdas first ordains the institution of the House of Justice and defines its functions. The institution's responsibilities are also expanded on and referred to in several other of Bahá'u'lláh's writings including in his Tablets of Bahá'u'lláh. In those writings Bahá'u'lláh writes that the Universal House of Justice would assume authority over the religion, and would consider matters that had not been covered by himself; he stated that the members of the institution would be assured of divine inspiration, and have the regard for all peoples and safe-guard their honour. Later, `Abdu'l-Bahá, Bahá'u'lláh's son and successor, in his Will and Testament, elaborated on its functioning, its composition and outlined the method for its election. He wrote that the Universal House of Justice would be under Bahá'u'lláh's protection, that it would be freed of error, and that obedience to it would be obligatory. `Abdu'l-Bahá first used the term "Universal House of Justice" to distinguish the supreme body from those local 'Houses of Justice' to be established in each community, and the secondary 'Houses of Justice' (current Bahá'í national spiritual assemblies). He also stated that the institution's decisions could be by majority vote, but that unanimous decisions were preferred, and that it would be elected by the members of the secondary Houses of Justice. He also confirmed Bahá'u'lláh's statements that its membership would be confined to men, and that the reason behind this decision would become apparent in the future. While both `Abdu'l-Bahá and Shoghi Effendi, heads of the religion after Bahá'u'lláh, considered establishing the Universal House of Justice, they both declined to do so. Shoghi Effendi's reason was due to his belief in the weakness of the existing Bahá'í institutions — there were a very limited number of national spiritual assemblies and local spiritual assemblies. Thus during his lifetime, Shoghi Effendi prepared for the election of the Universal House of Justice, by establishing a strong administrative structure at the local and national levels. 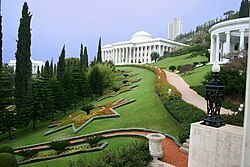 In 1951 when there were 9 national spiritual assemblies, Shoghi Effendi appointed members to the International Bahá'í Council, and described it as an embryonic international House of Justice. After Shoghi Effendi's unexpected death in 1957, the Hands of the Cause directed the affairs of the religion and announced that the election of the Universal House of Justice would occur in 1963 at the end of the Ten Year Crusade, an international teaching plan instituted by Shoghi Effendi. In 1961 the International Bahá'í Council was changed to an elected body, with members of all National Spiritual Assemblies voting for its members. Then in April 1963 the first Universal House of Justice was elected, six years after the passing of Shoghi Effendi, by 56 national spiritual assemblies. The date of the election coincided with the completion of the Ten Year Crusade and also with the first centenary anniversary of the public declaration of Bahá'u'lláh in the Garden of Ridván in April 1863. Since then the Universal House of Justice has acted as the head of the religion; in 1972 it published its constitution. The Universal House of Justice is elected through secret ballot and plurality vote in a three-stage election by adult Bahá'ís throughout the world. The House of Justice is elected without nominations or campaigning and all adult male members of the Bahá'í Faith are eligible for election to the House. The body is elected every five years during a convention of the members of the various National or Regional Spiritual Assemblies (NSAs) across the world. Each member of the various NSAs, who were themselves elected by the Bahá'ís of their country, votes for nine adult male Bahá'ís. Absentee ballots are mailed or carried by delegates. The nine people who have the most votes are elected onto the Universal House of Justice. Women are not eligible for election to the Universal House of Justice. `Abdu'l-Bahá stated that the wisdom for this will become clear in the future, and that women and men are spiritually equal. For more on this issue see Bahá'í Faith and gender equality. The most recent full election was on 29 April 2018.. Furthermore, the Universal House of Justice is instructed by Bahá'u'lláh to exert a positive influence on the general welfare of humankind, to promote a permanent peace among the nations of the world, ensure the "training of peoples, the up building of nations, the protection of man and the safeguarding of his honour". The Universal House of Justice is supported by the elected national and local governing bodies of the Bahá'í Faith, (the National Spiritual Assemblies and Local Spiritual Assemblies respectively). It has, furthermore, created several appointed institutions to support its work around the world; among these are the Continental Board of Counsellors and the International Teaching Centre. ... the Universal House of Justice has been invested with the function of legislating on matters not expressly revealed in the teachings.... whose exclusive right and prerogative is to pronounce upon and deliver the final judgement on such laws and ordinances as Bahá'u'lláh has not expressly revealed.... Neither the Guardian of the Faith nor any institution apart from the International House of Justice can ever usurp this vital and essential power or encroach upon that sacred right. Severed from the no less essential institution of the Universal House of Justice this same System of the Will of 'Abdu'l-Bahá would be paralyzed in its action and would be powerless to fill in those gaps which the Author of the Kitáb-i-Aqdas has deliberately left in the body of His legislative and administrative ordinances. While being empowered to legislate on matters, the Universal House of Justice has, since its inception in 1963, been limited in its exercise of this function. Instead it has generally provided guidance to Bahá'ís around the world; this guidance has generally been through the form of letters and messages, much like Shoghi Effendi's communications. Many of these letters have been published in compilations and are regarded as divinely empowered and authoritative; its legislative decisions are considered infallible to Bahá'ís. The letters cover a range of subjects including teaching, prayer, family life, education and Bahá'í administration. Each year on the first day of Ridván (which may be on April 20 or 21 depending on the dating of Naw-Rúz) the Universal House of Justice addresses a message to the worldwide Bahá’í community, known as Ridván messages. The institution has also collected and published extracts from the writings of the Báb, Bahá'u'lláh and `Abdu'l-Bahá. In 1992 they published the Kitáb-i-Aqdas, Bahá'u'lláh's book of laws in English, and further translations have since been published. During these endeavours, they established departments of research and archives at the Bahá'í World Centre, and, as of 1983, have collected over 60,000 letters of Bahá'u'lláh, `Abdu'l-Bahá and Shoghi Effendi. These collected works have been used as a base in the deliberations of the Universal House of Justice. The Promise of World Peace (1985). Statement addressed "To the Peoples of the World", presented to over 160 heads of state and government. It outlines the major prerequisites for, as well as the obstacles working against, the establishment of world peace. Marking the centenary of the passing of Bahá'u'lláh, this statement is a review of his life and work. The Prosperity of Humankind (1995). A statement on the concept of global prosperity in the context of the Bahá'í Teachings. Review of the 20th century, focusing on dramatic changes and the emergence of the Baha'i Faith from obscurity. Letter to the World's Religious Leaders (2002). Letter addressing the disease of sectarian hatreds. Calling on all religious movements to "rise above fixed conceptions inherited from a distant past." The initial election in 1963 drew five members from the International Bahá'í Council, two from the National Spiritual Assembly (NSA) of the United States, one from the NSA of Britain, and one from the NSA of India. Members are entered in the table under the year when they were first elected. Starting with the first election in 1963, regular elections of the entire membership have occurred every five years, and there have been five by-elections, noted in the table with italics, in 1982, 1987, 2000, 2005 and 2010. All members have continued to serve after re-election in subsequent conventions. Amoz Gibson, Charles Wolcott, and Adib Taherzadeh died while in office while the other former members were allowed to retire. ^ a b c d e f g h Smith 2000, pp. 346-350. ^ Smith 2000, p. 348. ^ UHJ 1996, p. 84. ^ a b Schaefer 2000. ^ a b Bahá'í International Community 2018. ^ Smith 2000, p. 359. ^ a b UHJ 1972. ^ a b c d Momen 1989. ^ Bahá'u'lláh 1994, p. 125. ^ Effendi 1938, pp. 150-153. ^ Effendi 1938, p. 148. ^ a b c d Smith 2000, pp. 350. ^ "Ridván Messages". Bahá’í International Community. Retrieved 30 March 2014. ^ Bahá'í International Community 2013b. ^ Smith 2000, p. 347. Bahá'u'lláh (1992) [Composed 1873]. The Kitáb-i-Aqdas: The Most Holy Book. Wilmette, Illinois, USA: Bahá'í Publishing Trust. ISBN 0-85398-999-0. Bahá'u'lláh (1994) [Composed 1873–92]. Tablets of Bahá'u'lláh Revealed After the Kitáb-i-Aqdas. Wilmette, Illinois, USA: Bahá'í Publishing Trust. ISBN 0-87743-174-4. Bahá'í International Community (2013a). "Baha'is elect Universal House of Justice". Bahá'í World News Service. Retrieved 2018-05-25. Bahá'í International Community (2013b). "Universal House of Justice Elected". Bahá’í World News Service. Retrieved 2018-05-25. Bahá'í International Community (2018-04-30). "Universal House of Justice Elected". Bahá’í World News Service. Retrieved 2018-05-25. The Bahá'í World 1993–94: an international record. Baha'i World Centre. 1995. p. 51. ISBN 0-85398-990-7. Momen, Moojan (1989). "Bayt-al-`Adl (House of Justice)". Encyclopædia Iranica. Effendi, Shoghi (1938). The World Order of Bahá’u’lláh. Wilmette, Illinois, USA: Bahá'í Publishing Trust. pp. 150–153. ISBN 0-87743-231-7. Schaefer, Udo (2000) . "Infallible Institutions?". Bahá'í Studies Review. 9. Retrieved 2014-09-29. Smith, Peter (2000). "Universal House of Justice". A concise encyclopedia of the Bahá'í Faith. Oxford: Oneworld Publications. pp. 346–350. ISBN 1-85168-184-1. Universal House of Justice (1972). "The Constitution of the Universal House of Justice". bahai.org. Retrieved 2008-10-17. Universal House of Justice (1996). Messages from the Universal House of Justice 1963–86. Wilmette, Illinois: Bahá'í Publishing Trust. p. 84. Retrieved 2014-09-29. Wikimedia Commons has media related to Seat of the Universal House of Justice.